As reported in NoCamels: When it comes to treating large, open wounds, not much has changed in the past five thousand years. Just as the ancient Egyptians used needles and thread to patch up their wounded, doctors employ the same stitching ‘technology’ today to prevent infection and facilitate healing. Nonetheless, when a wound is too big, too complex, or when the patient is subject to a higher mortality rate, the average suture procedure just doesn’t do it. While treating numerous casualties in his capacity as chief of plastic surgery at Israel’s Hillel Yaffe Medical Center in Hadera, Dr. Moris Topaz realized that sutures could not effectively seal cuts and fasten the skin together for proper healing. According to him, in the majority of cases, surgery was the only viable solution to treat and close complex wounds, which led Dr. Topaz to develop a unique method to secure wound closure, called TopClosure. An invaluable medical tool already being applied in Israeli hospitals, TopClosure works by first stretching out the skin around the wound to avoid the need for skin grafts, and second by ensuring that the wound scars in an aesthetic and healthy fashion. According to Dr. Topaz, it’s time to bid farewell to skin grafts, surgery and stitches for complex wounds, and to welcome a new method that he hopes will soon become the standard in severe wound treatment. The TopClosure tension-reduction system consists of two main parts: fastening cables and attachable clasps. The cables come in a variety of lengths to accommodate the size of the wound, and each clasp contains an adhesive bottom to mount onto the skin, as well as hole for staples if additional support is needed. The two clasps are placed facing each other on opposing sides of an open wound, much like two supporting ends of a bridge. A cable is strung through the clasps, drawing the skin tissues together until they eventually close. Stitches are then applied over this temporarily facilitated enclosure as the final seal. Indeed, TopClosure’s unique method is likely to improve the current suture practice significantly. The method can be used before surgery to prepare the skin incisions, during surgery to relieve tension on the skin, and after surgery as additional fastening support along with stitches, to speed up the healing process as a whole. A kind of modern tourniquet, TopClosure can and already is being used in field hospitals to temporarily treat soldier’s combat wounds and prevent immediate infection as they await proper medical care. Though Dr. Topaz himself has been using the product already for years, the marketed version of the TopClosure tension-relief system took him and his team about one month to develop as a physical product, but several years for improvements. By documenting every suture surgery he’s performed while using TopClosure, Dr. Topaz has built an extensive record of the different types of wounds, body location, patients, and even situations in which the TopClosure method proved effective, as well as those in which it didn’t. 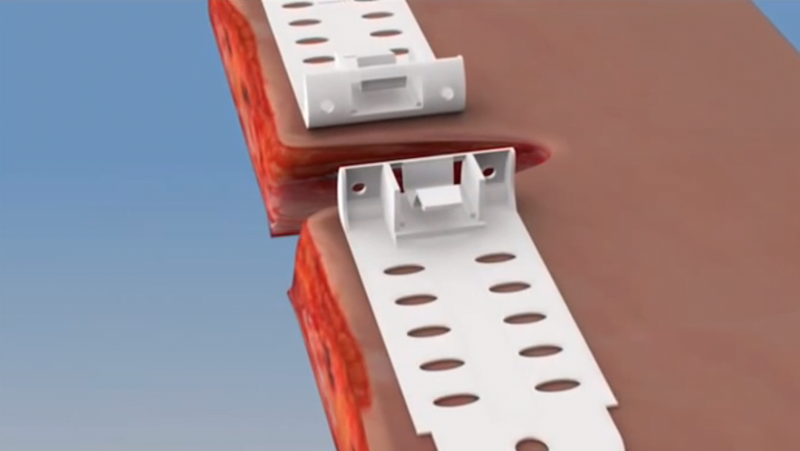 Although complicated and long suture surgeries will require an ‘invasive’ use of TopClosure, which means using staples to provide additional mounting support for the clasps, the potential scars left behind by staples are minor compared to the deep scarring caused by strained suture pulling and/or skin grafts. Furthermore, infections can still occur around the TopClosure system if the clasps are not closely observed during the healing process. Currently, TopClosure is publishing more updated cases of its use in medical journals. Yet, given the understandably conservative culture of the medical world, it will take time before TopClosure is accepted as a legitimate and commonplace apparatus among surgeons around the world. In the meantime, three different models of TopClosure are available for purchase on the company’s official website.